Expect to hear the pitter-patter of construction any moment. Cedar Street's conversion of the Agudas Achim Synagogue at 5029 N. Kenmore was issued building permits on December 4 according to Chicago Cityscape. 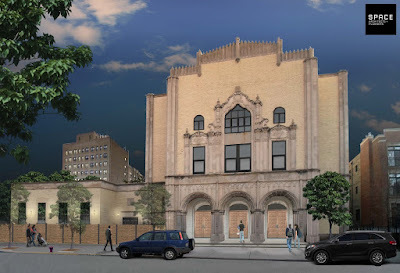 The historic synagogue built in 1922 will be converted into a total of 40 residential units. There will also be 21 parking spaces on site. Does anyone know what is happening to the stained glass windows from the Synagogue? I really hope they are not just shattered or chucked into the trash. The people at Cedar Street aren’t stupid...and we know from other high-profile projects they’ve done in Uptown that they do things right. If they don’t incorporate those windows into their rehab of the building, they would probably sell them because they’re valuable. They won’t get shattered or trashed. That's nice but I'm going to stop by Ostermann's office tomorrow to double check on that. What is the occupancy rate of all these buildings Cedar owns? Do they actually have people moving in? Seems to be a lot of conversion and building; but I see the same-o same-o rundown people in the neighborhood. Contrary to what one person keeps repeating, Lawrence House is at capacity. I just checked the website and there are a handful of studios and one bedrooms available for rent. I suggest you get a coffee at Heritage Outpost and enjoy the beautiful lobby and see the flurry of activity in the building.